The recent fine weather saw me heading off to Wasdale for what had been planned as a few days cycling and camping with my cousin Brian, though plans were quickly changed when he suffered a training injury and had to bail at the last minute. Overdid it on the burpees apparently! 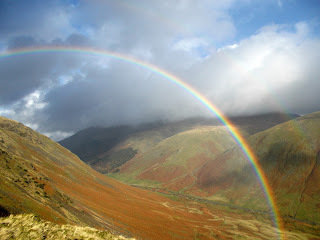 I went to Wasdale anyway but minus the bike and headed for the hills instead. 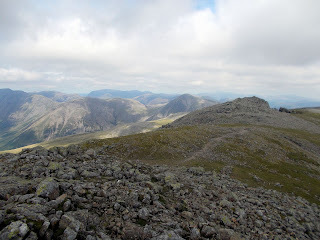 In a bid to avoid the bank holiday weekend crowds flocking to Scafell Pike and Great Gable, I opted to launch a second attempt on a hill that had defeated me on a previous occasion owing to weather and distance. I had nicknamed Caw Fell "the farthest away mountain" owing to its distance from my Wasdale camp and its status as the remotest of all of the Wainwrights (Lakeland fells or mountains) from human habitation. 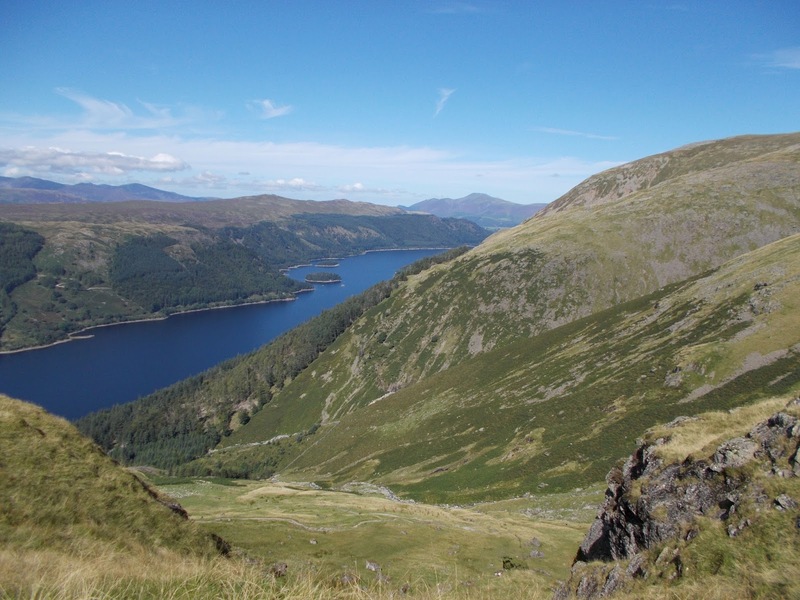 The height is modest but it does lie in the empty quarter between Ennerdale Water and the uninhabited marshy tract of Blengdale - a valley that few visitors to Lakeland have even heard of let alone visited. 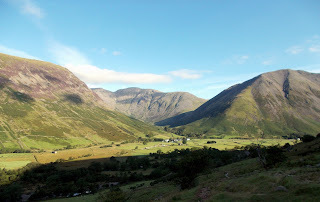 So it was that I set out from the National Trust campsite to walk up the lane to Wasdale Head and crossed the stone bridge over Mosedale Beck immediately behind the inn. Here a good path led into Mosedale beneath the craggy ramparts of Yewbarrow, on the opposite side of the beck to the Black Sail track which leads to the pass and the youth hostel of the same name and into Ennerdale or on to Buttermere. 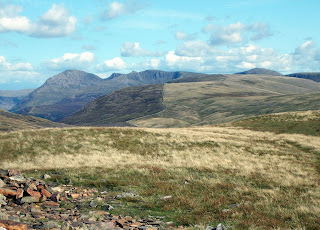 Presently Red Pike, my first objective, could be seen ahead and well over 2000 feet above. The way to it led past a scree slope and then steeply up towards the col known as Dore Head that separates Yewbarrow from Red Pike. Going up here is hard work however you look at it and on a warm June morning it was challenging. 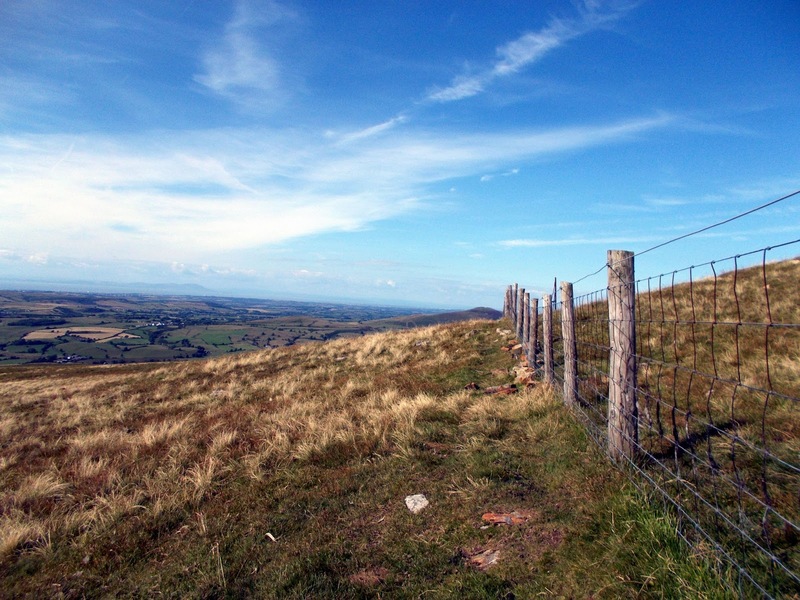 In the upper stages the angle of the slope is a sustained 45 degrees and it's important when resting to keep hold of items such as cameras and rucksacks as retrieving them from a thousand feet down the slope is simply not an option. 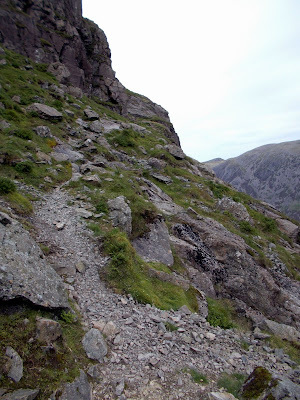 Thankfully the steep and unstable looking scree slope could be avoided on a path to its right and eventually Dore Head was reached where I could rest on level ground once more. From here one turns right towards Red Pike which rises in a series of grassy steps interspersed by short easy rocky sections. 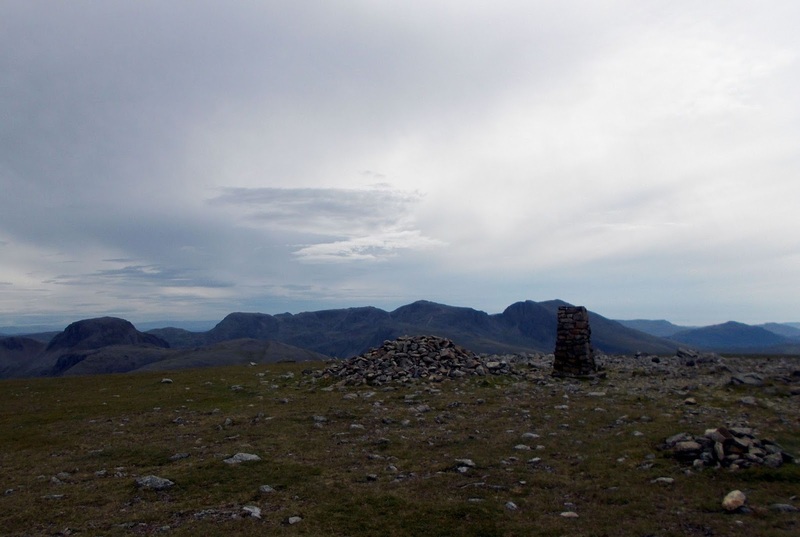 The main cairn on Red Pike lies at 2629 feet above the Irish Sea which was visible to the west, which is curious as the summit is just a little further on at 2707 feet. 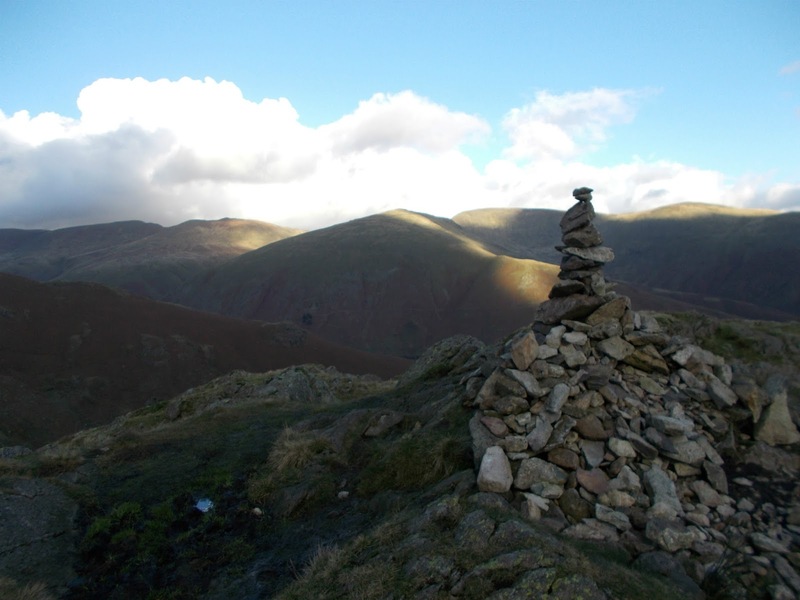 Here the much smaller cairn is perched in a splendid location atop the precipice that falls to Mosedale. Red Pike (Wasdale) by the way is not to be confused with the Buttermere Red Pike which rises just north of here across the Ennerdale valley. From Red Pike my route lay down the broad ridge ahead and up to Scoat Fell, a direct approach is best from the depression as the path bears right towards Pillar. 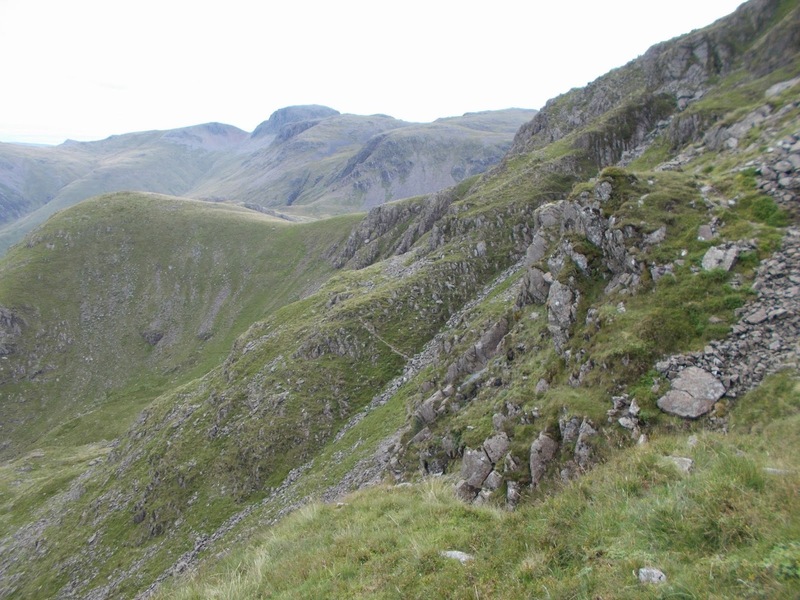 That is the route of the Mosedale Horseshoe which circuits via Pillar, Black Sail Pass and Kirk Fell; a fine route but not the one I was following today. 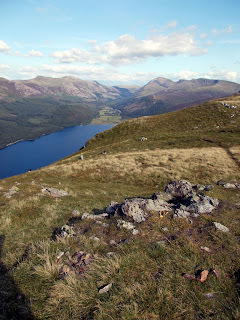 The top of Scoat Fell was the day's highpoint at 2760 feet though I decided against visiting the peak of Steeple which lies ten minutes along a short narrow ridge on the Ennerdale side. If you haven't done it before it's a must - one of the finest summits in the Lake District - but I still had a long way to go and didn't want to be out in the sun for longer than needed. From Scoat Fell I headed westwards down a wide grassy slope towards the rounded summit of Haycock. Passing the less obvious path to the left by a cairn at the lowest point, which would be my route back to Wasdale, I toiled up to the top of Haycock in a sun that was becoming more ferocious as the day went on. It was around 26-27 degrees (around 80 fahrenheit) in the valley which made a pleasant change from the norm but the uphill sections were harder going and I was glad to have done the main climb out of the valley in the cool of morning. From the stony top of Haycock the path led down the far side to grassy ground once again and skirted the craggy bluff of Little Gowder Crag well to the left. If you're a peak bagger doing the two thousanders then you have to go up there - for us doing the Wainwrights, bypassing it will do. Now it was just a case of following the wall - there is a path on both sides - all the way along to the small cairn marking the summit of Caw Fell. 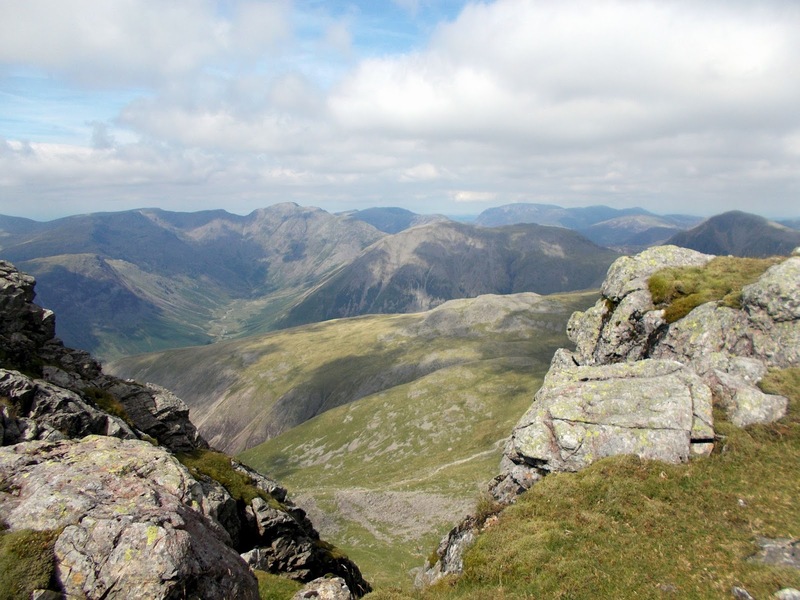 This summit doesn't match Steeple or Red Pike for dramatic position but it is a place of wild beauty where the hills roll to the distance on all sides, and on a day like this it was unrivalled as a place to rest and have lunch. On a wet or misty day I would imagine it would not be so appealing. The isolation meant though that I still had a fair walk - including a second ascent of Haycock - to get back to the valley. 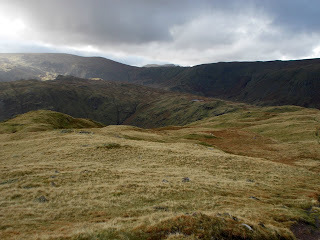 I retraced my steps to the cairn on the col between Haycock and Scoat Fell and headed right - down into the side valley of Nether Beck where, after a pleasant downhill walk of nearly four miles I emerged at Nether Beck Bridge. This path is patchy in its upper sections though lower down it becomes much clearer while glimpses of Wastwater guide the weary walker back to civilisation. In all this is a trip of just over 12 miles with 3650 feet of ascent that visits four Wainwrights; Red Pike 2707ft, Scoat Fell 2760ft, Haycock 2618ft and Caw Fell 2288ft. 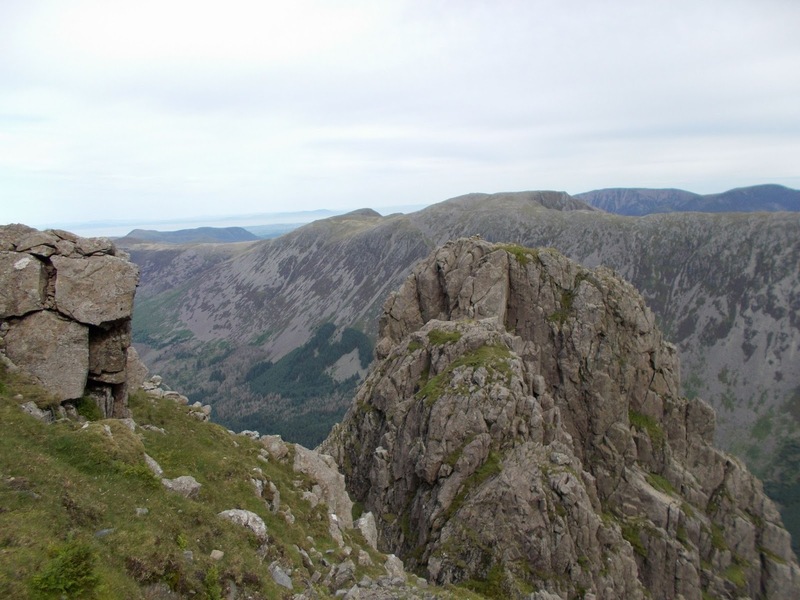 There is the option to add Steeple (2687ft) if you haven't been there before by adding half an hour to the walk or Yewbarrow (2058ft) by adding rather more. 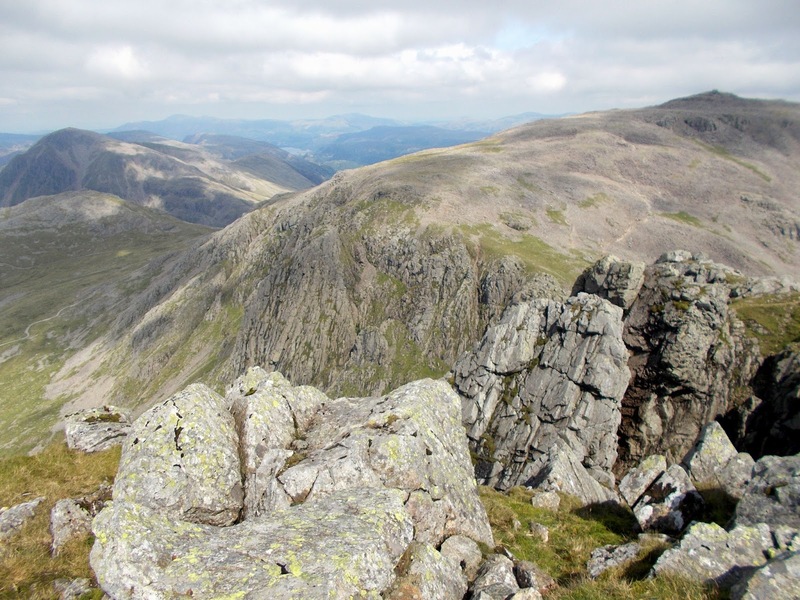 The ascent of the latter involves a rocky scramble from Dore Head and is probably best done separately - especially if Caw Fell is an objective. There are not many walks in Lakeland that reach the summits of four Wainwrights with so little effort, but this route from Grasmere does just that. 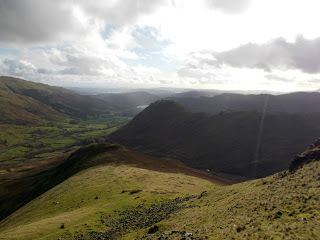 It's a particularly beautiful and varied walk too and the four hills it climbs are ones I had not previously visited; Steel Fell, Calf Crag, Gibson Knott and Helm Crag, so I was on new ground myself today. Setting out from Grasmere and following the lane northwards past Ghyll Foot and Helm Side, a good path leads from the end of the road onto the south ridge of Steel Fell which rises interminably ahead. 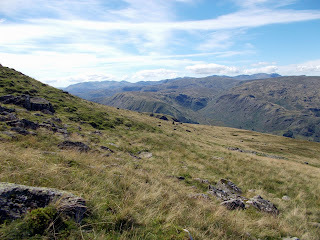 The way is without difficulty; being up grassy slopes but it is somewhat relentless... 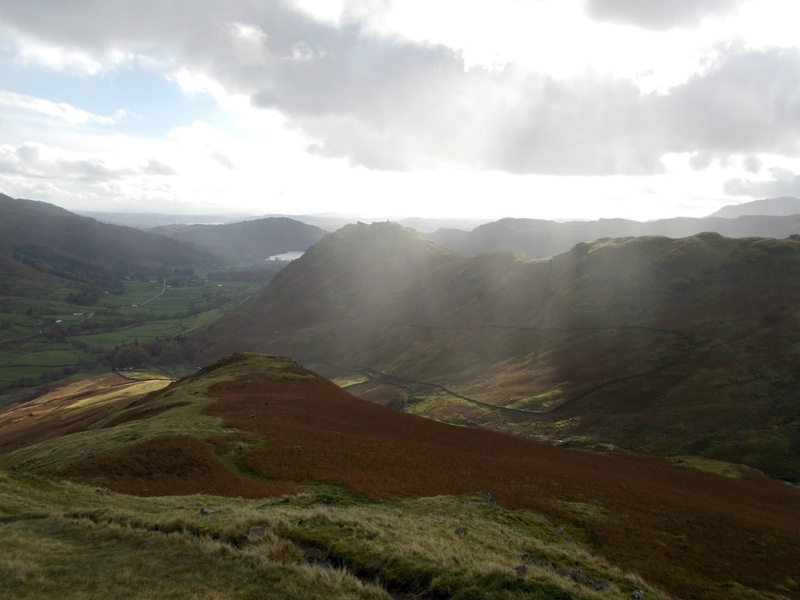 The views well compensate though, with the prospect back over Grasmere drawing the eye towards the distant Windermere which lies like a silver ribbon to the South. 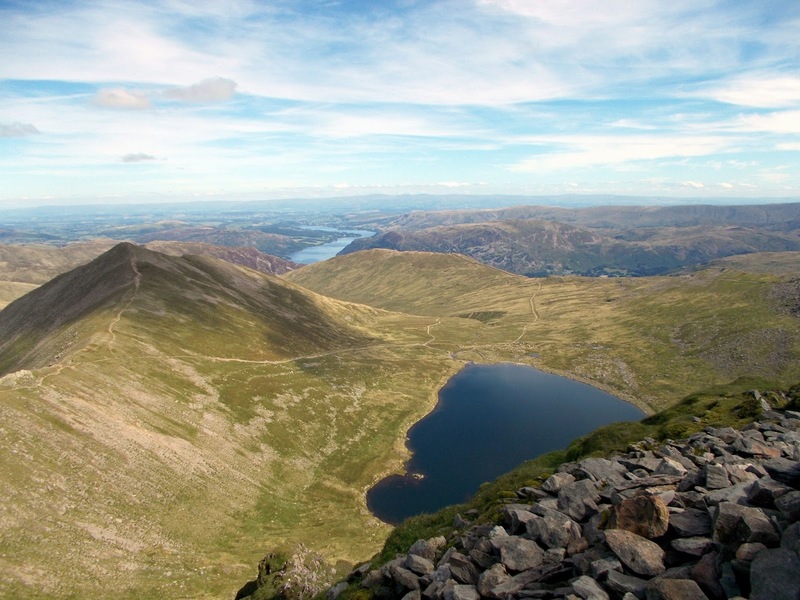 A much wilder prospect lies northward though, where Helvellyn dominates the scene and to the west stretch the windswept hills of Central Lakeland. were spared getting soaked. Part way up the ridge though I was given cause to run up the hill to capture on camera a particularly vivid rainbow that appeared beyond the brow of the hill ahead though my effort was rewarded with a particularly nice photo. The summit of Steel Fell is worth any effort involved in getting here with the view opening out along Thirlmere to the north complementing the softer southern prospect - check out the 360 degree panorama video at the end of this post. the boggy areas that make up this empty region. The path is evident for most of the way but one must be creative for the rest! The short rise to the summit pretty much marks the end of the sogginess though and a new prospect opens up of the route onward over the small but interesting peaks of Gibson Knott and Helm Crag backed by the wooded valleys and glinting lakes of southern Lakeland. countless times though today was my first ascent. The highest rocks are a little way north of the Lion and the Lamb and involve a tricky scramble to reach though to reach the Lion's head is a much easier undertaking. Even here care is needed as the other side of the rocks drop steeply so it's not advised for young children. Crag without doing the full ridge. Overall this was a good day out with great and varying views throughout the walk made better by the fact that it was my first visit to these hills. 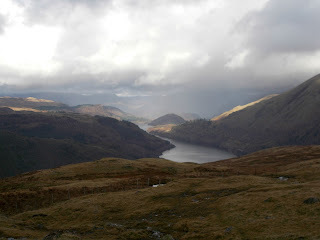 I especially liked the contrast between pastoral Grasmere and Steel Fell's wild uplands with the views to Thirlmere - oh and don't forget looking down from the Lion and the Lamb after so many times looking up at it! 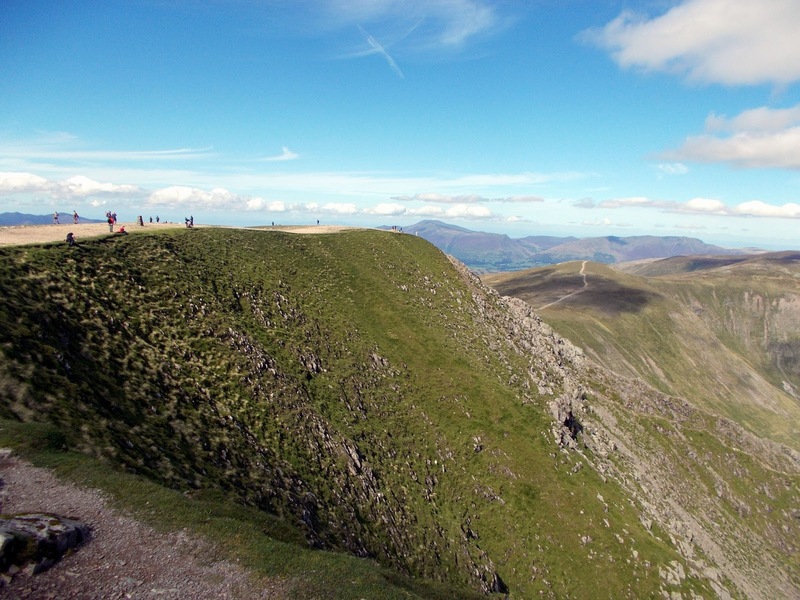 Check out the 360 degree summit panorama below - impressive for a peak of such modest altitude! 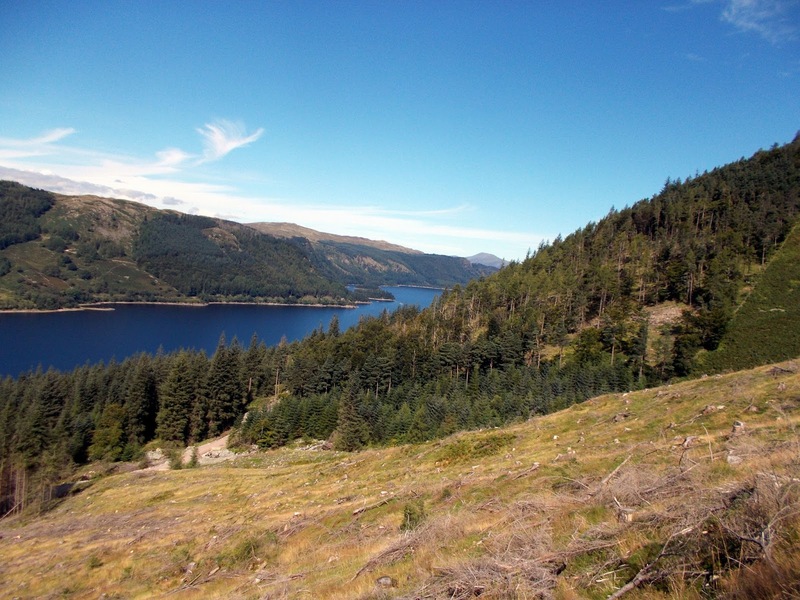 river on the left; to cross a forestry road before leaving the sheltering trees for the open fell side above. The way ahead is never in doubt and soon enters a steep sided valley where the gradient of the path eases before climbing steeply up the right slope below crags. 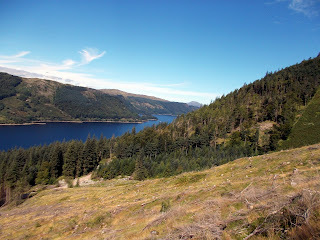 Soon the easy grassy slopes above are reached and the path again turns back around to the left with spectacular views northward along Thirlmere to where the prominent peak of Skiddaw stands in apparent isolation. rarely used, soon passing a large rock that makes a comfortable rest stop with views towards the hills around Wasdale and Buttermere away to the west. This is a tranquil place on a warm day and it is worth lingering before rejoining the rest of humanity on the summit. 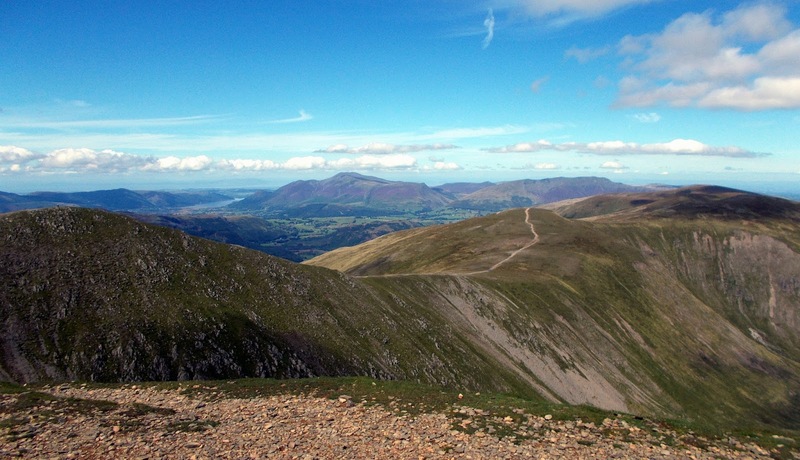 up to the summit at 3116ft or 950m above sea level – the third highest point in the Lake District. 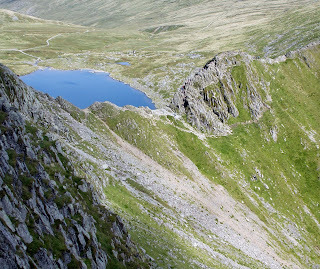 After enjoying the views I returned by the normal path – remember to branch down to the right at the fork before Nethermost Pike or you will end up at Grisedale Tarn and wonder why you never passed it on the way up. 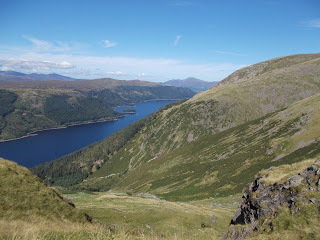 In total it’s a climb of 2550ft or just under 800m and a distance of just over 5miles/8km in total. despite technical issues involving camera batteries. 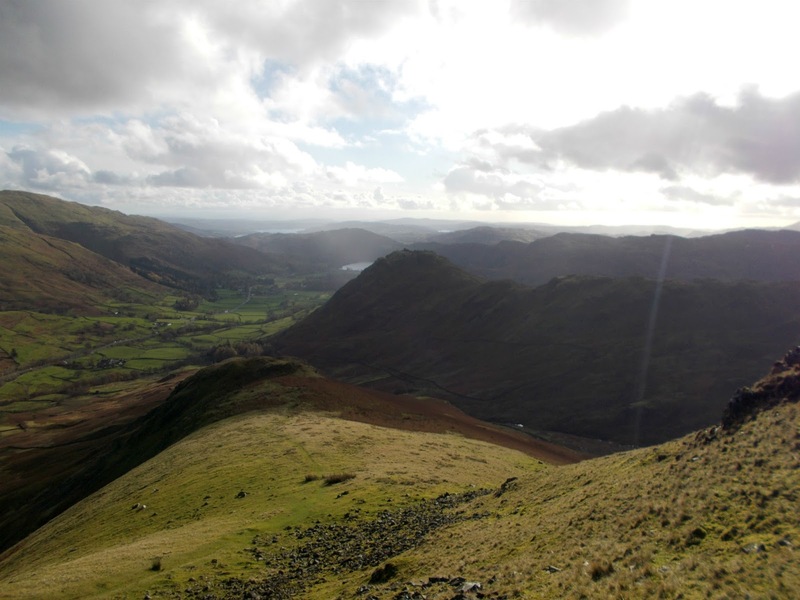 In the Lakes, every second walker I talk to seems to be doing the Wainwrights just as in Scotland the obsession is with the Munros. The one advantage of this gratuitous peak bagging though is that it does take you away from the usual routes and into new places often far from the beaten path. After all there's only so many times you can climb Scafell Pike or Ben Nevis! 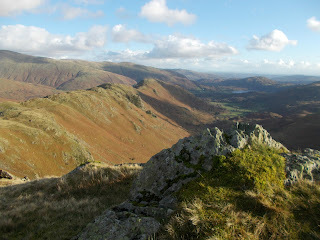 Brothers Water area and Fairfield across the valley. 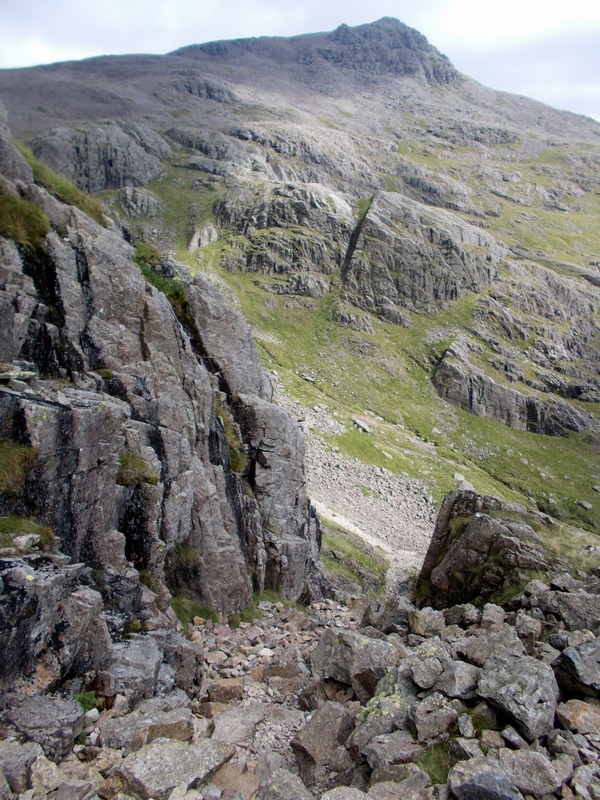 When a large boulder is reached after the wall, a fainter path leads back again and up the steep slopes. This way - with some meandering near the top - brought me to Brock Crags the first summit of the day. 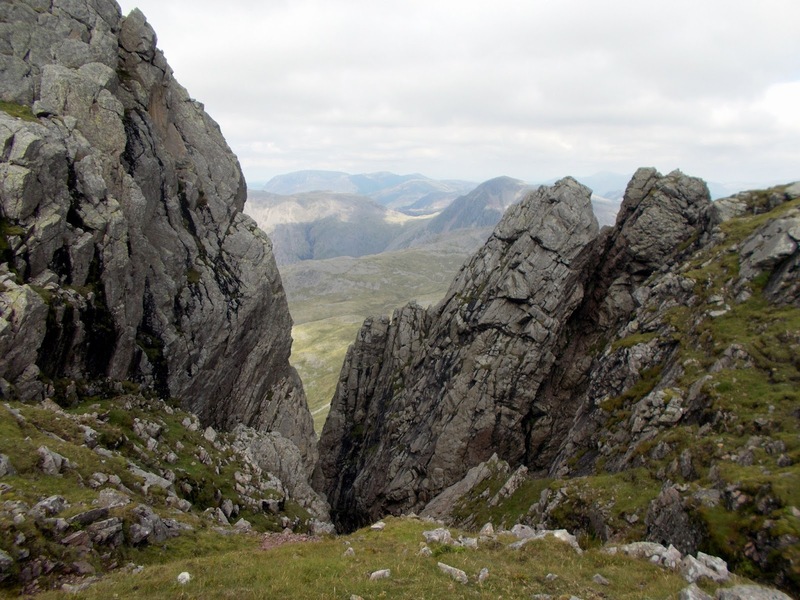 For its lowly altitude Brock Crags is a fine viewpoint and well worth the climb which while short, is steep in its latter stages. 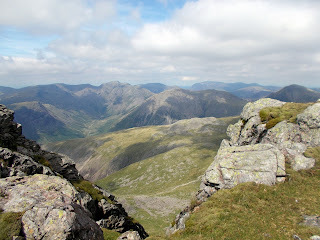 From here I followed a path that led back to the main trail to High Street that crosses the fells here. 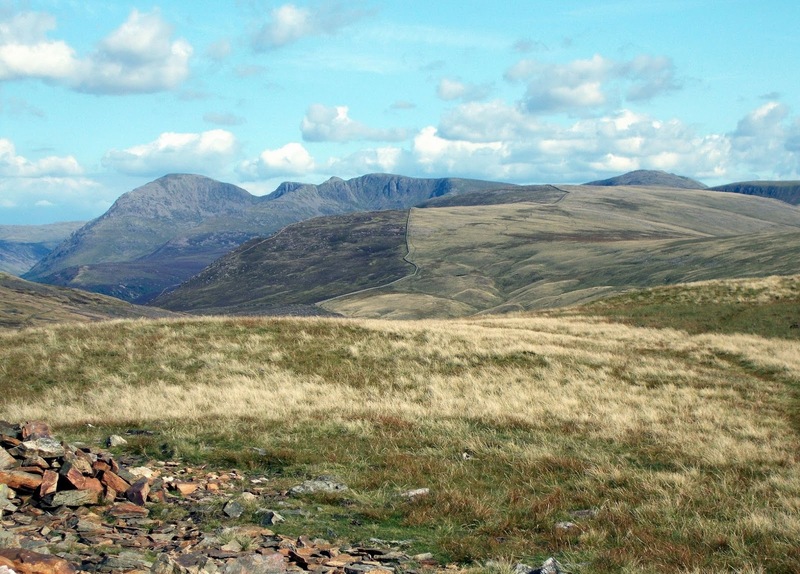 A short distance from the path, Satura Crag is worth a visit for the views it affords in all directions - especially to Boardale and to Angletarn Pikes just beyond Angle Tarn. For peak baggers who haven't already been to the Pikes, it's a short distance left or west on the main path but my route lay the other way over Rest Dodd which would be my high point of the day at 2278ft or 696m. From the summit of Rest Dodd I headed steeply down in a northerly direction along a path that led to the grassy plateau between Rest Dodd and the Nab. Numerous peat hags are in evidence here though keeping right avoids the worst of the bogginess and if the path is followed you should stay dry. Halfway to the Nab was a large isolated boulder - the only rock for some distance around - that I termed a "rest rock" as it was a good place for lunch. The location was extremely peaceful on what was a fine day and curious in the fact that from here one can not see the valleys or indeed any sign of human life. 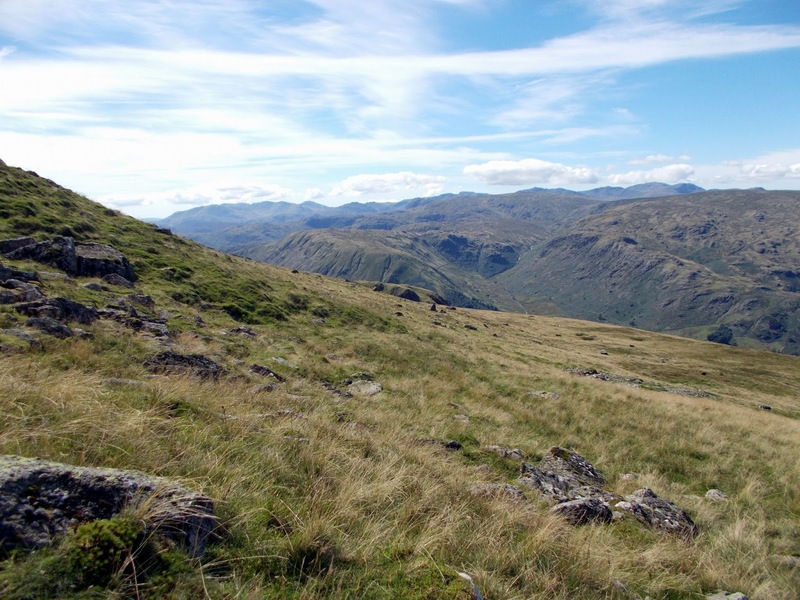 Only the surrounding fells are visible seeming to rise like islands in a sea of grass. Rest Dodd in particular is well seen from here. 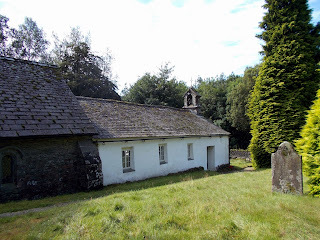 of Martindale too. The Nab is something of a sea of grass too but a pleasant enough place. Even in the summer holidays you'll likely have it to yourself. 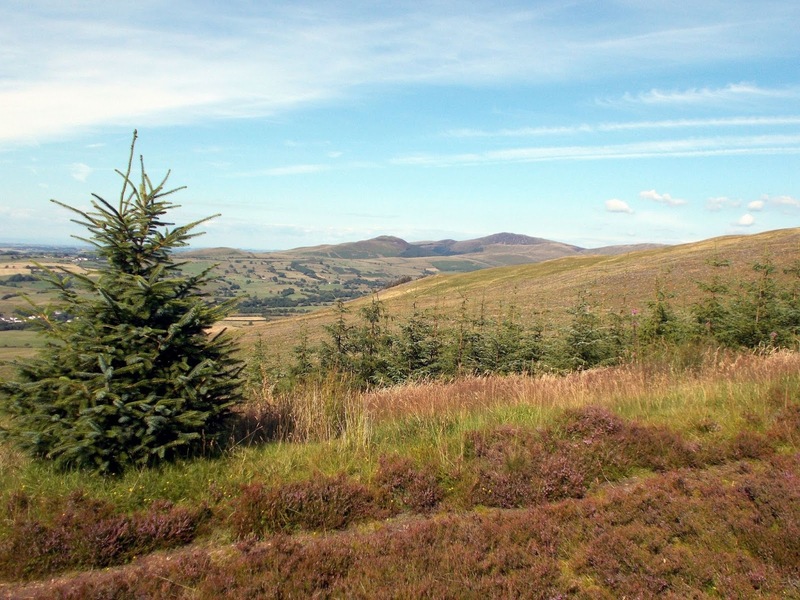 It's situated in the Martindale Deer Forest and there's apparently a good chance of spotting them though I wasn't lucky in this respect today. Returning from the Nab and back over the wide grassy section which lasts about a mile, a wall is reached just after the ascent of Rest Dodd is started. 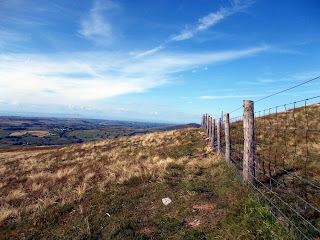 Instead of climbing all the way up to the top again I passed the wall and followed it to the right across the fell side which saved a steep climb. 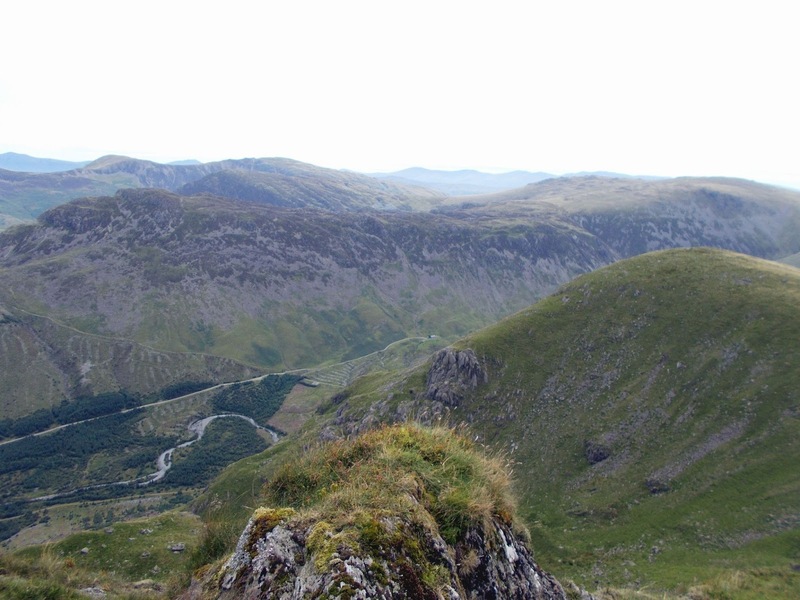 A faint path is presently joined that emerges on the north west side of Rest Dodd, rejoining the path I'd earlier taken to that summit. vary the route I headed back to the main High Street path and turning left, followed it approximately south east towards the bulk of the Knott, leaving it to descend to Hayeswater. 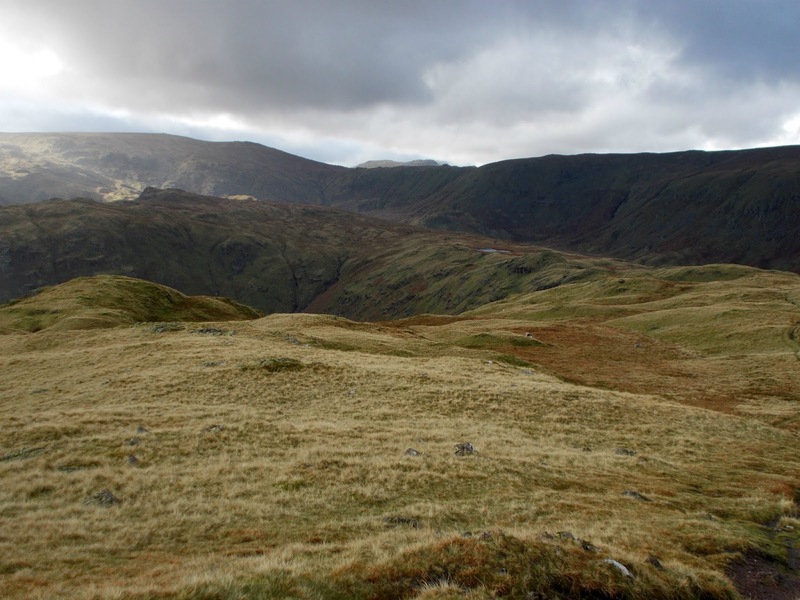 Incidentally; for those who may be unfamiliar with Lakeland, High Street is the highest point of the area known as the Far Eastern Fells and is named after the Roman Road that follws the ridge. There are no shops up here! From the lonely Hayeswater reservoir in its steep sided valley, a wide track was followed all the way back to my start point at Hartsop. In all a walk - as done - of 12km or about 8 miles visiting three summits; Brock Crags (561m), Rest Dodd (696m) and the Nab (576m) though it would not add to much to also visit Angletarn Pikes and even the Knott if so desired. less enthusiasm than the old ones it didn't happen today. I did manage these few photos though. The film clips will appear on my new channel which will be called Pete's Tales from the Hills. 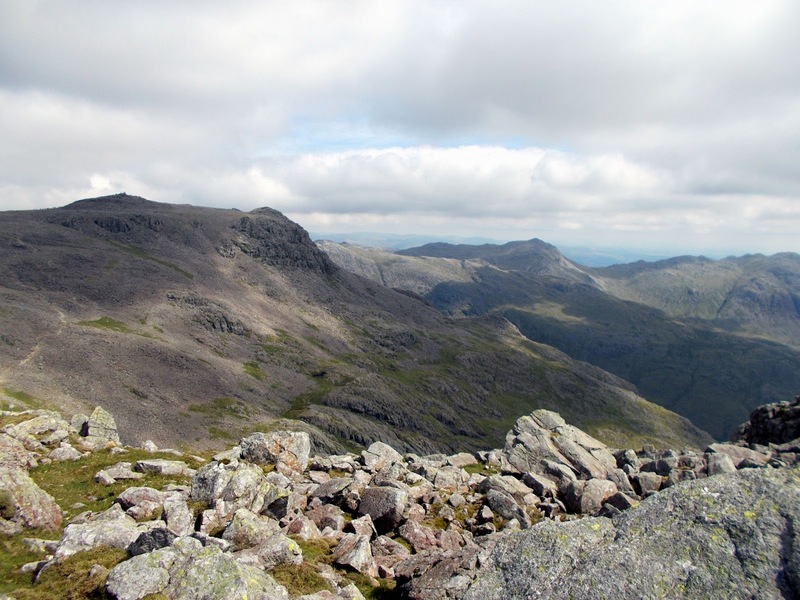 The number of people hiking up Scafell Pike every summer would probably fill a football stadium but the neighboring peak of Scafell - though an equally fine expedition when the rain stays away - is far less frequented. 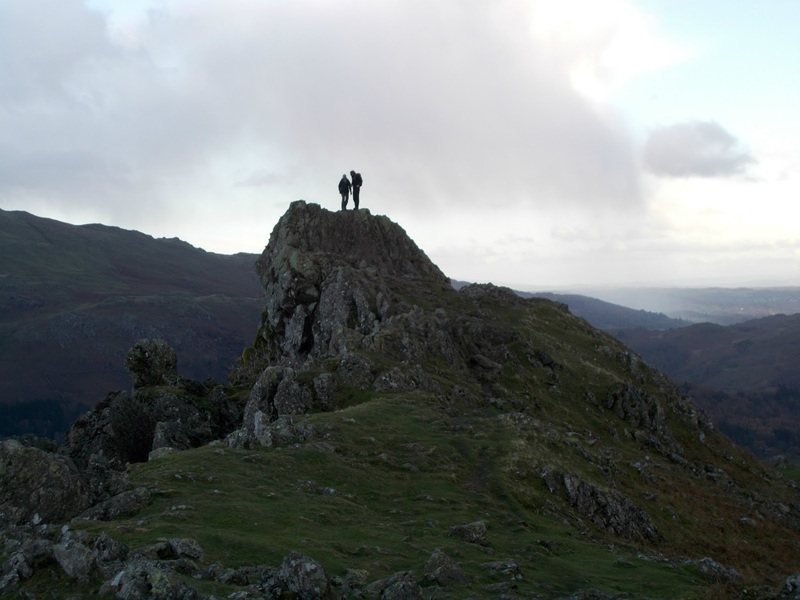 England's second highest peak is definitely the abode of the fellwalker rather than that of the tourist. 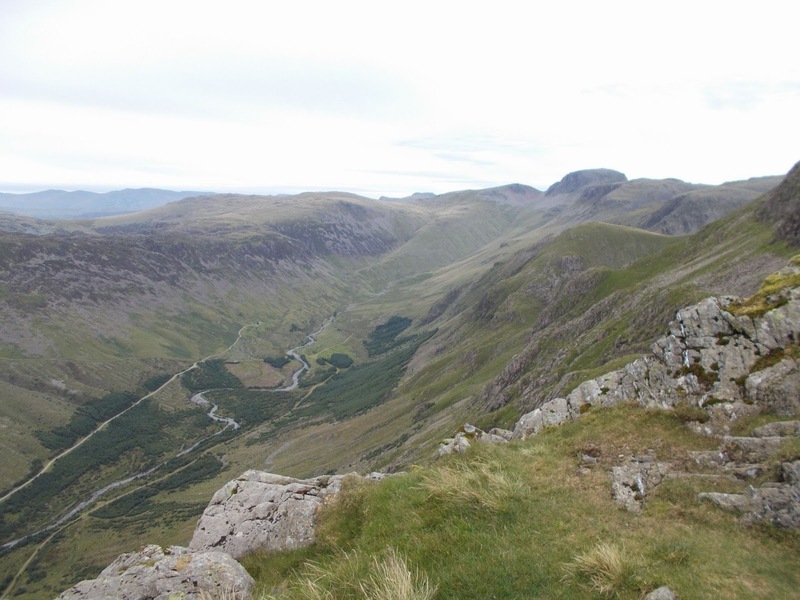 The route initially follows the same path (from Wasdale Head village green or the National Trust campsite - the paths converge shortly after where the first two photos were taken - initially following the stream of Lingmell Gill and then up the relentless slopes to Hollowstones - the wild and rock cwm below the peaks. The way to the Pike - and the crowds - branch off to the left while our route continues up over rough steep terrain to Mickledore the obvious col between Scafell and Scafell Pike at about 2650ft..
Head down the far side for a short way towards Upper Eskdale, keeping to the right which avoids a boulder field, until the gully is spotted leading up through broken crags to the right. Going up here can be wet after rain as it doubles as a stream bed but it's not boggy and we stayed dry today! 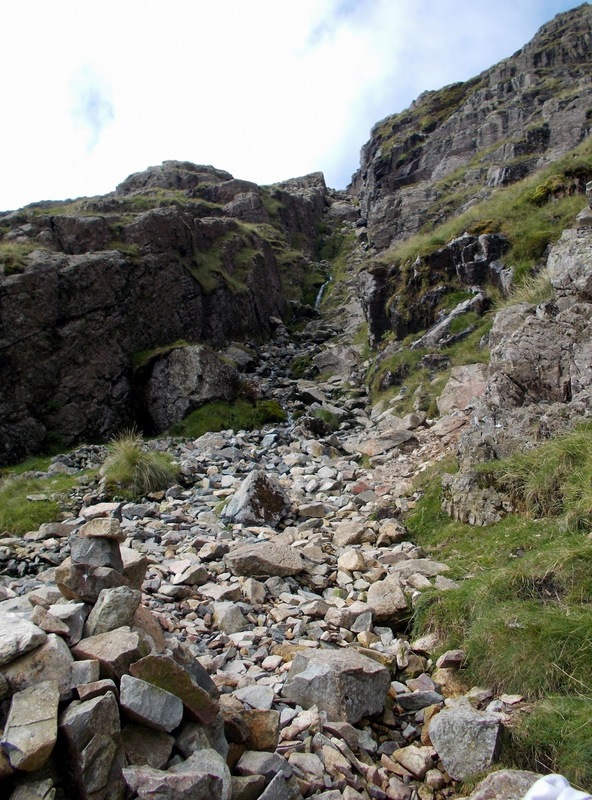 The path is clear up past Foxes Tarn - which turns out to be a small pool with a rock in the middle - and on up to the summit of Scafell which at 3162ft is the second highest point in England. If anything this route is harder than the slightly higher Pike due to the roughness of the terrain and the descent from Mickledore. The rock scenery up to the ridge is sublime and the ascent of the Foxes Tarn gully exciting but not difficult or exposed. We descended west from the summit via the Green How route which is without difficulty unless you follow our route down the steep scree back to Lingmell Gill - better to continue on down to Brackenclose and the campsite. 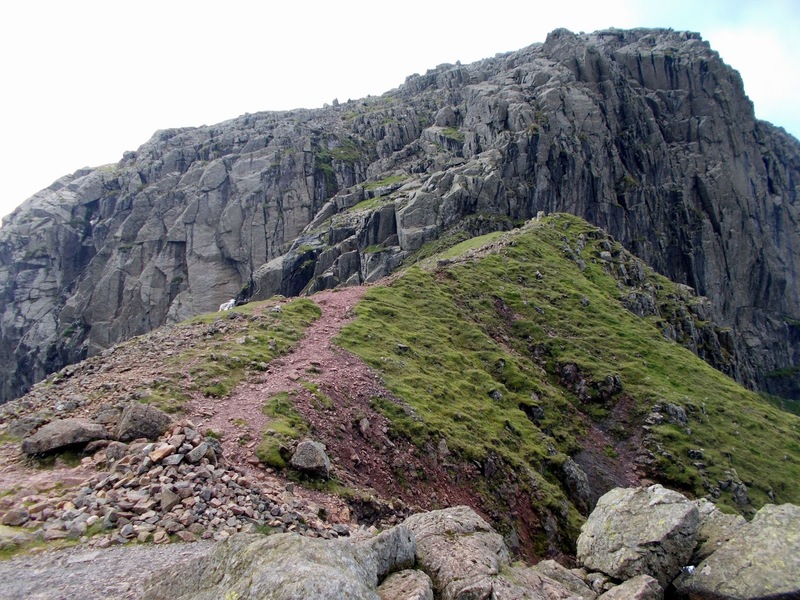 The Lord's Rake route was subject to rock falls some years back and has a large boulder to be negotiated. 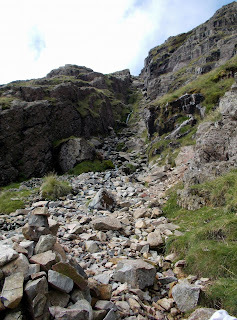 It's passable but there's always a risk of further rock falls and this route is a straightforward one. 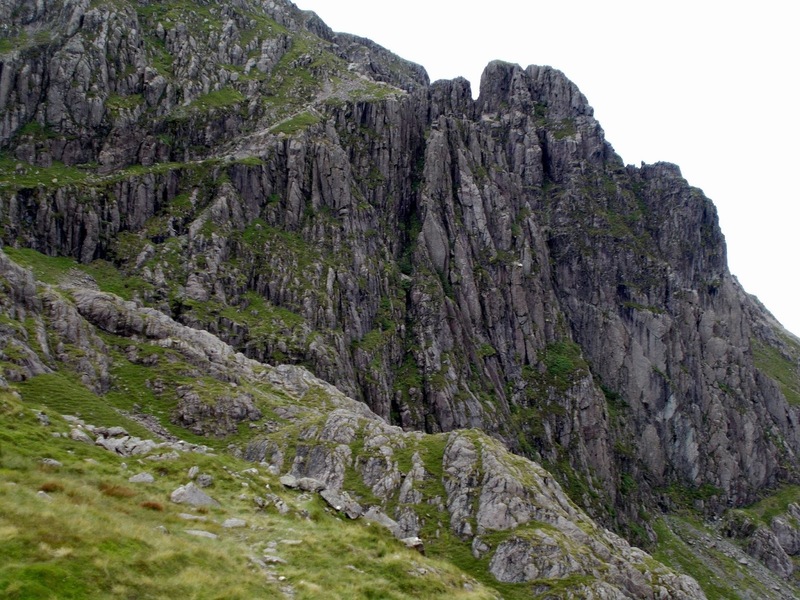 Do not be tempted to go up Broad Stand - the direct route from Mickledore unless you're an experienced rock climber - it looks short but it's a climb rather than a walk and without a belay rope a slip would not end well! Pillar has always been one of my favorite mountains of the Lake District but for some reason I had never walked the so called High Level Route until a week or so ago which was a shame as it turned out to be one of the best walks in the area. 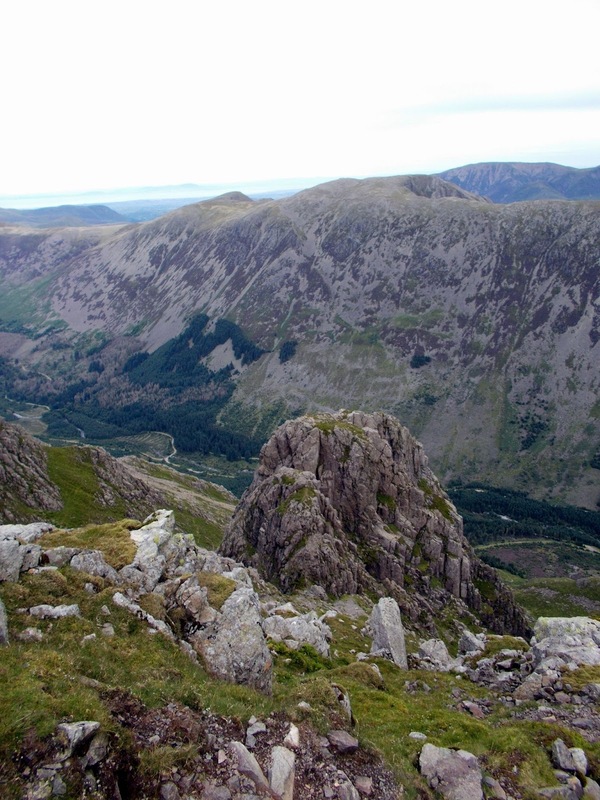 The trail leaves Black Sail Pass; the col that links Wasdale Head with Ennerdale, and initially follows the usual route to Pillar along the first part of the ridge. After Looking Stead which is worth a visit in itself as a viewpoint, a cairn is seen a short way up the path to Pillar. 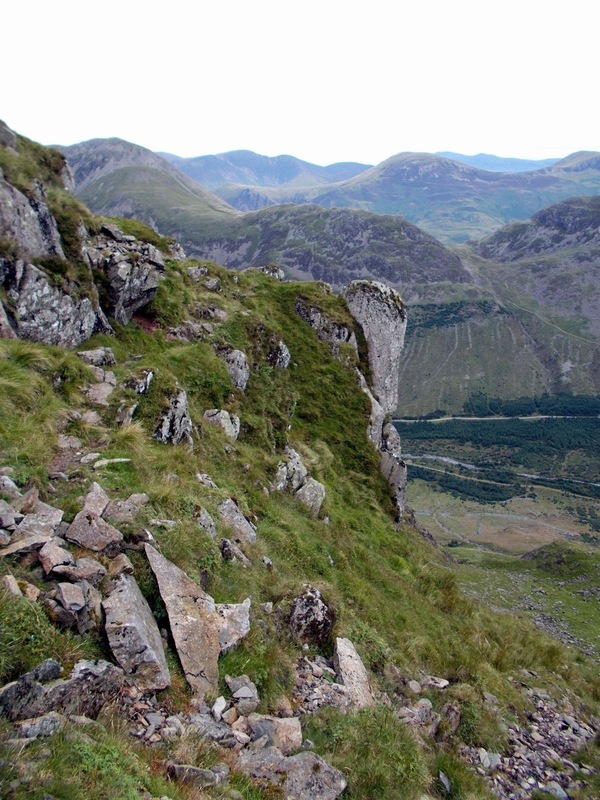 Here a path leads off to the right and follows an exciting route across the rugged mountainsides overlooking the wild upper reaches of Ennerdale and leading to the summit above the great bastion of Pillar Rock. 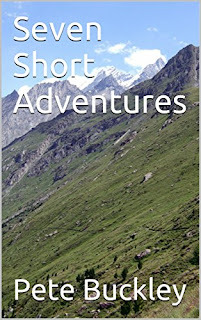 This route ventures into mountaineering territory though if the path is kept to it remains easy throughout.and is undoubtedly the finest way to Pillar. I wouldn't do it in the snow without the right gear as there are a few places where it wouldn't be good to slip but the path is easy to follow most of the way This is very much a walk on Lakeland's wild side with the unpopulated Ennerdale being below throughout and despite it being a great route I had it to myself today.. The track along Ennerdale makes a great bike ride (MTB) and there's a link at the end of the post to that and also on the route to Black Sail itself. 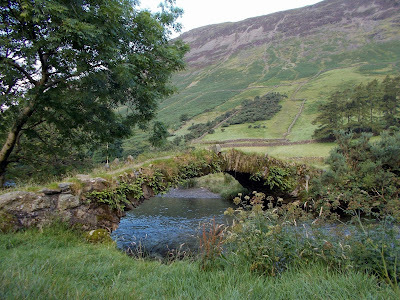 This is a beautiful bridge (behind the pub at Wasdale Head) but don't cross it as its the wrong way - carry straight on and bear left over a stile into Mosedale for the way to Black Sail. 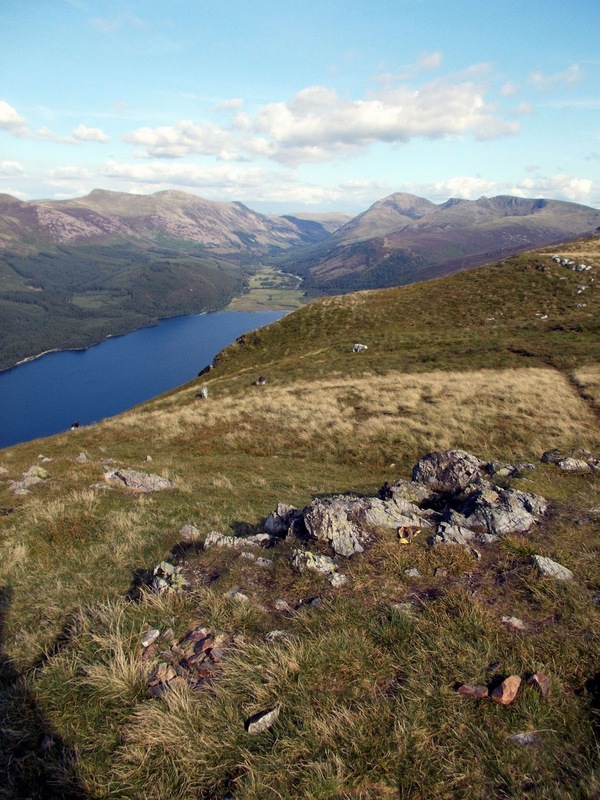 Looking down to Ennerdale from the first part of the High Level Route - the River Liza and the track to the Black Sail Youth Hostel can clearly be seen. That track is great on a mountain bike. Ahead from Robinson's Cairn with the 200m high bulk of Pillar Rock barring the way. The route goes up the low rock ridge in the foreground and across the ledge top left - the Shamrock Traverse. The start of the Shamrock Traverse - it looks daunting from below but the way is wide and not too exposed though You would need to gear up if it was icy. The summit of Pillar 2928ft is level ground in contrast to the route we've just followed; Great Gable, Great End Scafell Pike and Scafell beyond. 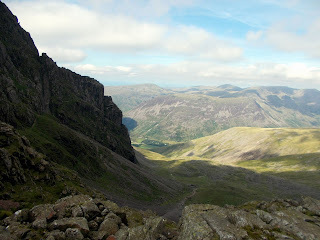 The way down to Wasdale (or Ennerdale) is by the usual route to Pillar. 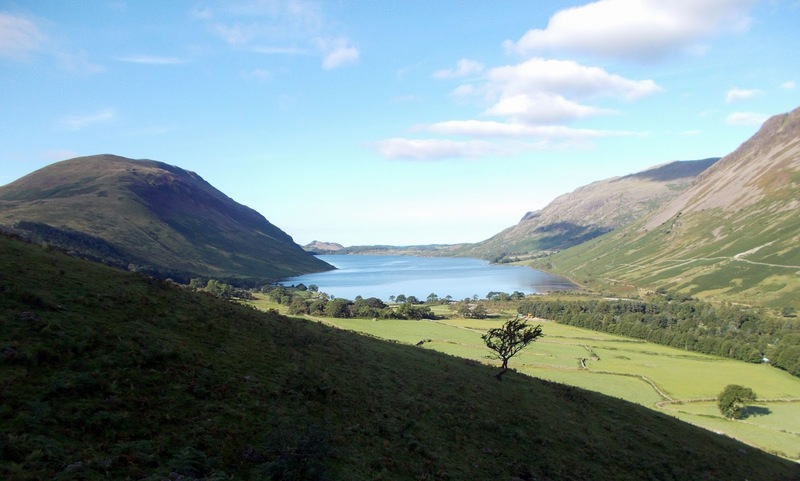 Here's a link to the bike trail through Ennerdale and the first part of the Four Valleys Walk describes the way to Black Sail Pass from Wasdale.